Handel's exciting and extravagant oratorio Alexander’s Feast is a work about the emotive power of music and an ode to St Cecilia. It describes a banquet held by Alexander the Great in the captured Persian city of Persepolis during which the musician Timotheus sings and plays his lyre. He arouses various moods in Alexander who is finally incited to burn the city down. Handel tells the story in musical multicolour which requires an exceptional team of musicians. Orlando Chamber Choir is proud to announce its co-operation with Handel specialists The Brook Street Band, expanded for the occasion to include horns, flutes, three bassoons, oboes, a trumpet, timpani, a harpsichord, an organ and a theorbo to accompany Timotheus. 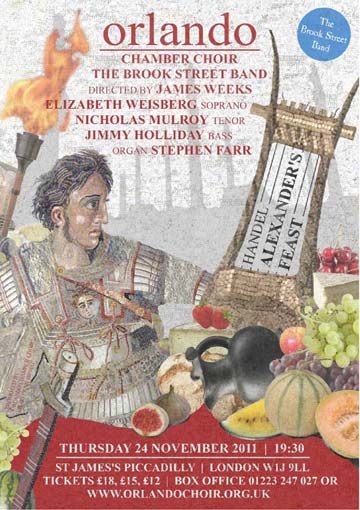 Alexander’s Feast is not only Orlando Chamber Choir’s largest and most sumptuous production to date, it is sadly also James Weeks’ last concert as the choir’s Musical Director. Please join us for this sparklingly spectacular send-off!